Price doesn’t seem to have changed much in the UK either. Hovering around at the paltry £3 mark. The excellent vinyl edition is ridiculously cheap still too. About £6 for new copies if you go through the marketplace. 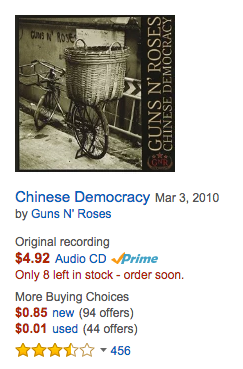 The price of CD’s in general has really bottomed out. It’s too bad I’ve given up on the collecting thing, because they’re practically giving them away. Remember when CD’s came in those long cardboard boxes and cost $30??? Man, times change. We never got the long boxes in the UK. I remember seeing some in Tower Records cause they had import stuff and wondering what they were! But I definitely remember paying through the nose for CDs back then! No long boxes! What about those dreadful plastic skeleton thingys that encased CD’s (roughly the same shape as the long box). This is starting to make me feel SUPER old, by the way. No, I don’t remember those at all. All the earliest CDs I remember seeing were all just basic jewel cases. I was a late adopter of CD though but I’m pretty sure they didn’t happen here.